Aberystwyth Pier at Aberystwyth PierThe Aberystwyth Pier at the southern end of the North Beach in the centre of the promenade was the first to open in Wales in 1865. After a series of storm attacks, it is now a much shortened version of its originally constructed length of 242 metres. The pavilion remains in good condition, and is a very popular venue with facilities including a pub, nightclub, restaurant, social and snooker club, amusement arcade, pizza and ice-cream parlours, and video shop. 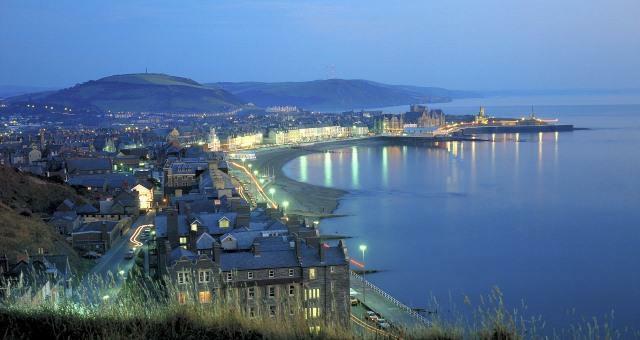 The Aberystwyth Pier at the southern end of the North Beach in the centre of the promenade was the first to open in Wales in 1865. After a series of storm attacks, it is now a much shortened version of its originally constructed length of 242 metres. 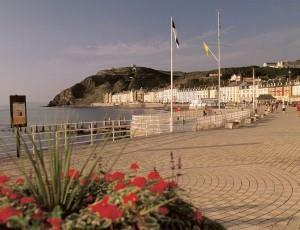 Adjacent to the Pier, the Aberystwyth promenade is one of the longest in Britain at 1.5 miles, located along the breathtaking Aberystwyth seafront. The lamposts are strung with lights, which creates an interesting ambience after dark. Flags of fifty nations line the entire length of this promenade and there are cafes, restaurants and coffee shops within easy reach in the town centre.